“LORD SHOW ME YOUR WAYS, MAKE MY CROOKED PATHS STRAIGHT, CLEANSE ME BY: YOUR PRESENCE, THE WASHING OF YOUR WORD, AND THE BURNING COAL ON YOUR ALTER.” WOW!! HERE IS WHAT TOOK PLACE AFTER SIX MONTHS OF PRAYING PRAYERS LIKE THIS. “For we are God’s fellow workers; you are God’s field, God’s building. According to the grace of God which was given to me, like a wise master builder I laid a foundation, and another is building on it. But each man must be careful how he builds on it. For no man can lay a foundation other than the one which is laid, which is Jesus Christ. Now if any man builds on the foundation with gold, silver, precious stones, wood, hay, straw, each man’s work will become evident; for the day will show it because it is to be revealed with fire, and the fire itself will test the quality of each man’s work. If any man’s work which he has built on it remains, he will receive a reward. If any man’s work is burned up, he will suffer loss; but he himself will be saved, yet so as through fire. Several years ago I listened to a tape of a Teacher in the body of Christ who was sharing his confession worldwide. He had built a large and strong organization with books, tapes, television & conventions but God revealed to him out of 1 Cor. 3:12-15, that at the end of this man’s life he was going to turn around and see his entire ministry judged by fire. He would see everything he built, burnt down and all of his human energy was of no heavenly value. Why? Because he was not careful how he built upon the foundation already laid. …that God had directed him in. In the same way, I took a hard look at what I was doing since I was called to the ministry in 1977. This led me to start praying prayers like: “Lord, show me Your ways, make my crooked paths straight, cleanse me by: Your presence, the washing of Your Word, and the burning coal on Your alter.” Wow!! Here is what took place after six months of praying those prayers. We discovered several insights to the awesome authority we the church had in Christ. Not only was Jesus our Savior and Lord, He was the Head of His Church. Therefore as His Church, we had authority in Him over “the gates of hell” and power in His Spirit over demons! As we continued our quest we discovered that Jesus’ Church had a beginning and it will have an end. The “Church Age” takes us somewhere. We could see the amazing love, respect and protective authority in true Christian relationships, plus the flexibility for God to add 3000 to their number in one day with little effort on the people’s part. Wow! This was great but there was no way that the traditional church system we had been submersed in for the past 20 some years could begin to facilitate this authority, freedom and growth. Why not? We listed dozens of reasons; lack of true relationships, greedy leaders, lazy people. Oops, we broke our own rule of no comparisons. It was amazing that we just couldn’t study this without comparing. Next, people in the study group were being offended because they used to attend here or there and that “place” was where they had an experience with Jesus etc. 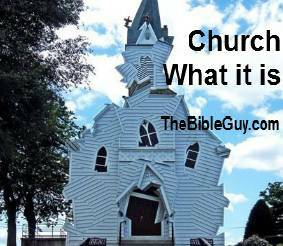 So not to be defeated, we flipped the question to ask, “what is the church not? Now we started getting somewhere! WHAT IS THE CHURCH NOT? The church is not a corporation: Even though our government encourages the body of Christ to register as a non-profit corporation with enticing tax breaks for financial donations, at least in the USA. The church is not a system of do’s and don’ts, rules and regulations or programs and entertainment: Yet people have given many hours of their lives to writing rules, filling out requisitions, working to top last year’s Christmas concert, and being praised for performing with perfection.“Lord Jesus, if what we have been “doing” for the last 2000 years is not what you intended, what should we do?” Our question was this: “Is there any example in the Bible or History of any people group that rebelled against the “out-of-order” temple system and yet remained righteous? HAVE YOU HEARD ABOUT THE ESSENES? Not many people recognize this name but most know about the Dead Sea Scrolls. These were a group of Jewish people that came together around 100 years before Christ. They were somewhat like the Pharisees in that they believed in the resurrection. But it is obvious that they separated themselves from the “politics” and corruption that came with temple worship and the priesthood. In their own writings this group recorded that they were awaiting the overthrow of the Jerusalem priesthood, which would happen when the Messiah would come. Until then, the community dedicated itself to studying the Scripture they had and living a life of moral purity. This group did see their Messiah come. They saw Jesus, the Son of our Living God fulfill the law, overthrow not only the money changing tables in the temple but the authority of the corrupted priesthood as well. Unfortunately, the Essenes, just like Jesus’ disciples, expected a quick physical take over. They expected the Messiah to physically remove the corrupted priest in the temple and physically overthrow Roman rule. They did not yet understand the teaching of Jesus that the Kingdom of God (rule of God) was within them. The end of the Essenes as a people group was around 66 AD as there was a Jewish Revolt against Rome and the Romans retaliated by destroying the Jewish city Jerusalem. The Essenes were wiped-out as they must have gotten caught in the “cross-fire”. They were probably hiding in the caves up above the Dead Sea as they took large clay jars and placed documents inside to preserve them. And preserve them they did! 2000 years later these jars were discovered in eleven of these caves above the Dead Sea. In the discovery year of 1947 the jars were uncovered and what was inside? Some personal writings of the Essenes that spoke of their lifestyle, community and the history already mentioned. But most important and the greatest discovery of all time: Scrolls of the Holy Scriptures were found! Manuscripts of the Bible more than 1,000 years older than any we previously had. Thus the name the Dead Sea Scrolls. So what’s the point? The point is that even history records that this small remnant of Jews knew the corrupt temple worship system was coming to an end. These people didn’t just complain about it, they chose to be a “remnant” trying to live pure lives while waiting for the Messiah to come! Waiting for the Messiah to fulfill the law and put an end to the temple system. To repeat a song lyric I heard on the radio, the problem about the mysteries of God is that they are so mysterious. Our small study group didn’t want to just study to gain knowledge, we wanted to experience the will and way of God! So with the encouragement of the Essenes, we decided to take action by stepping out of the corrupted temple worship pattern (traditional religion) and try to walk in these new truths we were discovering. Paul wrote that the church and Christ have been a profound mystery, hidden in the past but made known today. In the past we could not see – today we know. Paul quotes the Old Testament Prophet Isaiah 64:4 speaking of things not yet revealed. In the next two verses Paul explains that now is the time that God is revealing His mysteries. Next, the response to knowing was acting on the knowledge by accepting Jesus into our lives personally and making a public testimony by being baptized with water as a symbol of being immersed into the body of Christ, His Church. Read, as the first followers of Christ record the mystery as it was unfolding. That makes the “new wine skin” the holder of the new wine or the new system for the “new wine” to function in. The following “new wine” items do not need the “old wine skin” which is the temple system, to function in or to be validated! Carefully, Look at the following list then compare with the ending scripture! Preaching, Salvation, Water Baptism, multiplying the number of people in the Kingdom, teaching, education, training, community fellowship, fellowship with God the Father, the Son, the Spirit, Communion or our Lord’s Supper and Prayer, All Kinds of Prayers. Stay focused here; resist drifting in your thinking, as this is a major, major revelation to our whole process! One man wrote a book about getting the “system” out of you after you are out of the “system”. Again the transition is right before our eyes! Read the following scriptures and look for the transition from the mobile tent or tabernacle with Moses and “the church in the wilderness” to the permanent temple building constructed by Solomon, later adding synagogues. After the resurrection of Christ meeting in the temple and “house to house” then only meeting in houses. See it for yourself, the last three transitions are recorded in Acts chapter two, five, and eight! GET READY HERE IT COMES! The following chapter reveals the turning point in scripture and history recorded in Matthew 7:13 the coming out of the “wide gate” of religion and entering into the narrow gate of the Kingdom of God. Leaving the “old wine skin” and becoming the “new wine skin” able to hold the new wine, which is; the anointed Son of God, the very Holy Spirit of Jesus inside of you, the transition of your sinful, filthy vessel into the very “Temple of God”! What have we discovered in Chapter One? Concerning the Church, each man must be careful how he builds on the foundation that has already been laid. The fire of the Holy Spirit will test the quality of each man’s work. What is the Church and what is the Church Not? The Essenes and the Dead Sea Scrolls. New Wine, Salvation, Christ in you. New Wine Skin, new system to contain the new wine. Start the transition from the temple to the home. Click to go to: CHAPTER TWO!